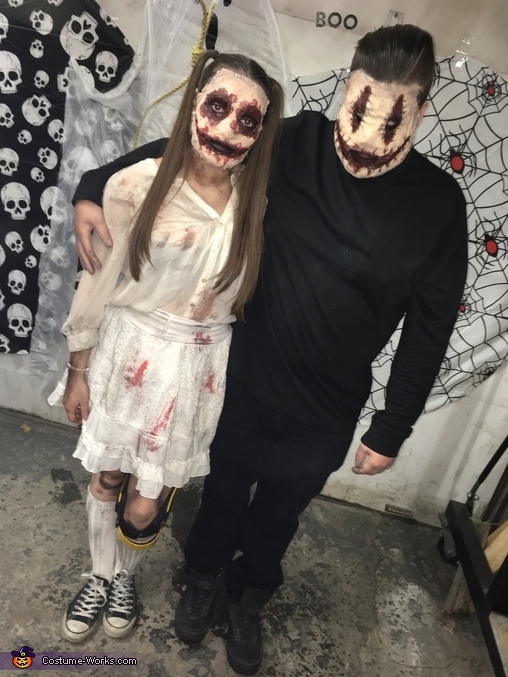 My boyfriend and I were doll and smiley for Halloween! We got the idea from Pinterest when searching for a scary couple costume. Smiley originates from the horror film "smiley". These costumes are homemade, we bought clothes from a thrift shop. I rubbed my clothes in the dirt and rubbed some black makeup and fake blood on them. We made our masks directly on our faces. We had to make liquid latex from scratch as every store was sold out. We made it with coconut oil, water, gelatine and corn starch. After letting it cool down, we applied a few layers of the latex to our faces, we then layered it with tape, and a few more coats of liquid latex. We then added tissue paper and more latex for each layer of tissue paper we applied. This gave it a more aging skin look. After letting it dry we spread foundation on it to make it match our skin colour. After letting that dry we put makeup around our eyes and mouth and applied some fake blood to it.